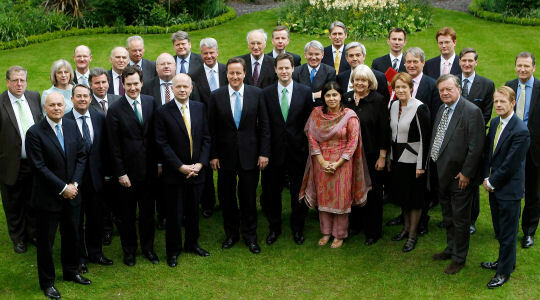 They are not all Oxford chums, millionaires and the Notting Hill set, but quite a large slice are. Who Knows Who examines the old rivals and new faces in the Con-Lib cabinet. The oldest is 69 (Ken Clarke), the youngest is about to turn 38 (Danny Alexander), 43 is the magic number. Two are former presidents of the Oxford Union (William Hague, Michael Gove) and two edited the Oxford student magazine (George Osborne and Chris Huhne). Only four are female, a fair few are millionaires and of course five cabinet members are Liberal Democrats. Does 'new politics' mean more Oxbridge males? Who Knows Who takes a look at the connections in the coalition Cabinet. Cameron's education and aristocratic background are by now well-known. The son of a stockbroker, he is a descendant of William IV, a former classmate of Prince Edward, an old Etonian (the 19th at Number 10) and, along with George Osborne and London mayor Boris Johnson, an ex-Buller boy (an Oxford club famed for drinking binges and vandalism). Cameron is a former special adviser to Norman Lamont who was succeeded as chancellor by the man picked by the PM as new Justice Secretary, Ken Clarke. Cameron's closest ally until now has been Osborne, the new chancellor, who is a personal friend and godfather of his children. His coupling with Nick Clegg could test this. Clegg's background all but twins him with Cameron. Swap Eton for Westminster, Oxford for Cambridge and a father who was a stockbroker for one that was a banker and the pairing seems natural. Clegg is reported to have joined the Conservative club at Cambridge in 1986 but has said he "can't remember" doing so. The Lib Dem leader worked for a former Tory home secretary Leon Brittan at the European Commission in the late nineties. His wife Miriam is a former colleague and friend of Cameron's chief of staff Ed Llewellyn. Clegg beat new Climate Change Secretary Chris Huhne to the Lib Dem leadership in 2007. One of two former presidents of the Oxford union here (the other is Education Secretary Michael Gove) Hague became an MP in 1989, succeeding Nick Clegg's old boss Leon Brittan to win the seat of Richmond in North Yorkshire. Hague beat off competition from Cabinet colleague Ken Clarke to lead the Tory party from 1997 until 2001. He was followed by another unsuccessful Tory leader, the new Work and Pensions Secretary Iain Duncan Smith. George Osborne, Cameron's close friend, is the youngest chancellor for 124 years. Like the prime minister, he was a member of Oxford's Bullingdon club and the Tory "Notting Hill set" of the late nineties and early 2000s. He is a multi-millionaire through his family wallpaper firm. He has an interesting link with new Lib Dem colleague Chris Huhne. Both are former editors of Oxford student magazine, Isis. Both Osborne and Cameron were junior advisers to John Major, the last Conservative PM. Osborne also worked as a speech writer for new Foreign Secretary William Hague. Clarke, the oldest Cabinet member, is regarded as a political "big beast". Cameron is the fourth Conservative prime minister he has served under after high-profile stints with Edward Heath, Margaret Thatcher and John Major. He may find some closer ties with his pro-Europe Lib Dem colleagues than with his old adversary Iain Duncan Smith, the Eurosceptic who pipped him to the Tory leadership in 2001. Along with Vince Cable, Clarke, a former chancellor, will be a reassuring presence to those who fear Osborne lacks Treasury clout. A former consultant at the Bank of England, May became an MP at the 1997 general election. She rose to prominence quickly and has always done well in Tory job hand-outs. She has served two former Tory leaders who now sit beside her in the new cabinet - William Hague and Iain Duncan Smith. When Cameron became leader, he made her shadow leader of the Commons. As Home Secretary, she is now the most high-profile woman in government. Liam Fox is one of the few members of the new cabinet who was not privately educated and did not attend Oxford or Cambridge. He grew up in a council house in East Kilbride. Fox became an MP in 1992 and later worked for both Hague and Duncan Smith as shadow health secretary. Fox is UK director of The Atlantic Bridge, a transatlantic committee set up to promote the UK's "special relationship" with the US. William Hague, George Osborne and Michael Gove sit on its advisory panel. Cable, a former Labour councillor who worked for the late John Smith, must now work in tandem with chancellor George Osborne. It is clear that, of the top Lib Dems, he is the most uneasy about the Con-Lib union. However, his mother was a Tory voter and his experience working as chief economist at both Shell and Chatham House add considerable financial experience to the team. He is the second oldest cabinet member after Ken Clarke. Duncan-Smith, a former Tory leader, is the only member of cabinet who did not go to university. The son of a Royal Air Force captain, he instead attended the Sandhurst military academy a few years after Prince Charles. He is an old rival to Ken Clarke (they have fought against each other for the Tory leadership and disagree on Europe) but his place in the cabinet should appease rightwingers who are sceptical about the Lib Dem presence. Huhne, before Clegg, attended Westminster School. He is one of nine Oxford alumni in the coalition cabinet. Like George Osborne he was a Demy scholar who edited the student magazine Isis. He lost the Lib Dem leadership battle in 2007. A former Labour activist, it is interesting to ponder whether the coalition would have come about with him at the helm. Huhne was, however, on the negotiation team which agreed the deal with fellow Magdalen graduate William Hague. The new health secretary is one of the few non-Oxbridge members of the new set-up. Instead he attended Exeter. The former civil servant worked as private secretary to Thatcher minister Norman Tebbit in the 1980s. Interestingly, Tebbit called for Cameron to burst the "Clegg bubble" during the election campaign and warned against the coalition deal. A Lansley-run campaign helped John Major retain power at the 1992 election. He later worked for Iain Duncan Smith on the failed 2001 Tory bid for power. Gove, like Hague, is a former president of the Oxford Union and like Osborne and Huhne has worked as a journalist. He has written for The Times and The Spectator and authored a biography of Michael Portillo, an old rival to William Hague. Gove also worked for BBC Radio 4's Today Programme. The new education secretary is regarded as one of the "new breed" of Tories, alongside Cameron and Osborne. They are the same age and graduated together before forming the so-called "Notting Hill set". Gove is a former chairman of rightwing think tank Police Exchange. Pickles is the Prescott to Cameron's Tony Blair. Proudly working class, one of his great-grandfathers helped found the Independent Labour Party, but Pickles switched to the Tories in 1968. The new Communities and Local Government Secretary is opposed to electoral reform, which will not endear him to his new Lib Dem colleagues. Meanwhile, in 2006 he took action to ensure a fish and chip shop in his constituency removed an "Eric Pickled Egg" from its menu. Another Oxonian, Hammond was a successful businessman prior to entering parliament in 1997. He was promoted to the Tory frontbench by new Cabinet colleague William Hague. Hammond is said to have amassed a wealth of £9m. He has previously worked as a consultant to the World Bank. Caroline Spelman is a cabinet rarity. She is female, state school educated and a graduate of neither Oxford nor Cambridge. A former commodity secretary at the National Farmer's Union, she became an MP in 1997 and was quickly promoted by Iain Duncan Smith. She has previously worked for new home secretary Theresa May on environment issues. She is married to Mark Spelman, a senior partner at Accenture. Mitchell is former president of the Cambridge Union and chair of the university's Conservative club. He served in John Major's government as a junior minister. He is one of several cabinet millionaires, with an estimated fortune of £2m. Paterson embarked on a career in the leather business after graduating from Cambridge. He is an outspoken Eurosceptic which will align him with Iain Duncan Smith against the Lib Dems. Paterson was first elected in 1997 and has been shadow secretary for Northern Ireland since 2007. Alexander is the youngest cabinet member and, along with Clegg, the unexpected star of election 2010. After leaving Oxford, he worked as a press officer, first for the Scottish Lib Dems and later for a pro-Europe pressure group. 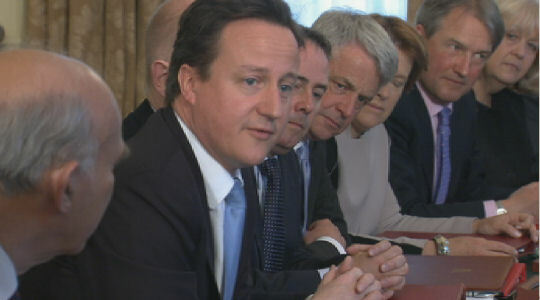 He will already be friendly with Cabinet colleague Ken Clarke, having worked with him at the Britain in Europe group. He also coordinated the Lib Dem 2010 manifesto. Gillan is one of several cabinet members hailing from a military family (Iain Duncan Smith, Jeremy Hunt). Her father was an Army officer, her mother a Wren. Gillan has served as the chairman of the right-wing Bow Group. She is another cabinet millionaire with a wealth of £1m. In 2009 it emerged she had claimed parliamentary expenses for dog food. Incidentally, she keeps chickens. Hunt, whose father was a senior officer in the Royal Navy, was head boy at Charterhouse before going to Oxford where he gained a first in philosophy, politics and economics (PPE). He comes from the Oxonian Tory set which includes fellow 43-year-olds David Cameron and Michael Gove. Hunt worked in public relations before entering parliament at the 2005 election. David Laws was a key figure on the Lib Dem negotiating team which brought about this coalition. The former JP Morgan managing director took over Lord Ashdown's Yeovil seat in 2001 after a series of high-profile roles in finance. He co-edited the Orange Book, which sets out liberal economic solutions, and will work closely with George Osborne at the Treasury. Lord Strathclyde is something of a Westminster veteran, having first arrived in SW1 in 1985. He was government whip in Margaret Thatcher's administration of the late 1980s. A former insurance broker, he was a minister of state at the Department of Trade and Industry during the 1990s. 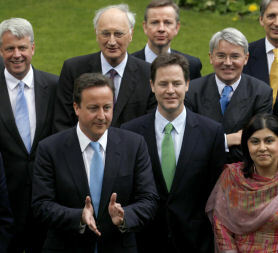 Sayeeda Warsi, the first Muslim woman to serve in a British cabinet, is one of David Cameron's "stars" and one of three still in their thirties (along with Osborne and Alexander). Warsi gave up her job as a solicitor in 2004 to stand for Parliament in her home town of Dewsbury, West Yorkshire, but lost out to Labour's Shahid Malik. She has previously worked as a special adviser to Michael Howard.